Are you a game-changing product entrepreneur? START100 provides funding, coaching, and mentoring for people like you. Accepted participants receive $50K in initial funding and access to follow-on funding. ROXs by A-Champs use the excitement of sensor technology and gamification to make any kind of training more fun. ROXs enhances the motivation to move and provides unlimited ways to train. No session has to be the same. State-of-the-art IoT technology is at the heart of ROXs. Multiple sensors detect and respond to tap, flip, toss, balance, and shake movements. Lights, sounds, and haptic clues stimulate senses. Reaction data, challenges, competitions, and programs drive motivation to move. Everyone will keep coming back for more ROXs time. kegg is the world’s first fertility tracking kegel. kegg uses advanced sensing technology called impedance spectroscopy for vaginal mucus measurement, which in simple words means streaming small pulses throughout the vaginal environment. Based on their responses, kegg knows how the fluid-structure changes. By sensing the changes in your vaginal fluids with impedance spectroscopy, kegg can determine when fertile cervical fluid is present. This process takes about two minutes and your data syncs to your phone in seconds. START100 is part angel fund, part accelerator, and part start-up coach for potential high-growth product entrepreneurs who are a great ﬁt for crowdfunding. We invest in product entrepreneurs, help them execute a successful rewards crowdfunding campaign, and build a foundation for long-term success. 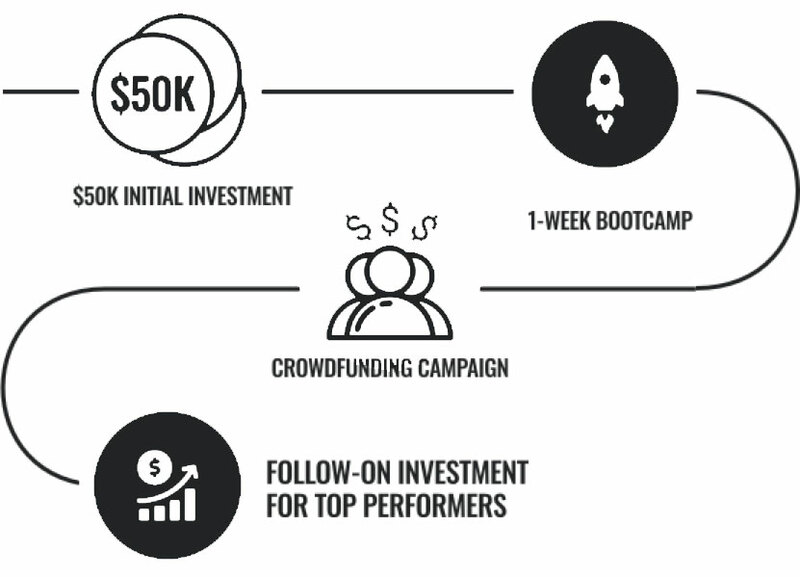 As a START100-backed entrepreneur, your journey begins with a $50K initial investment to fund your rewards crowdfunding campaign. You'll attend a 1-week boot camp in Charlotte to plan your professionally managed campaign with leading crowdfunding marketing firm, Enventys Partners. After the campaign, top-performing START100-backed entrepreneurs are eligible for follow up investments. Managed by leading crowdfunding marketing firm, Enventys Partners. Crowdfunding offers a combination of market validation and built-in audience base that no other form of funding can. Through our partner’s database of 100K+ backers and the hundreds of thousands more that use Kickstarter and Indiegogo, START100 companies have access to early adopters who understand crowdfunding and are on the lookout for new products. A successful Kickstarter or Indiegogo campaign is the perfect way to show future investors that there is a legitimate market for a new product or service and build up a customer base.